Eton mess sounds rather posh doesn’t it? However this clever dessert makes use of any broken meringues you may have – homemade or shop purchased – and can be prepared in minutes. It is simply a mix of double cream, broken meringue and chopped strawberries but you can vary the recipe to your own taste. Traditionally this dessert is served at Eton College during their summer after their annual prize giving. But these days various versions of this delicious dish can be served all year round. History tells that the dish came about after a Labrador dog sat on a picnic basket and crushed the content. Whatever the reason this is a truly mouth watering dessert for any occasion. 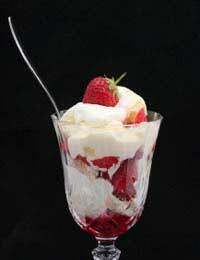 The three main components of Eton mess are strawberries, double cream and meringue. But why not be adventurous and add other ingredients to this dessert and make it your own family favourite? Strawberries are one of the main components of this recipe and so the dish used to be served in the summertime when fresh English strawberries were at their best. However with strawberries being grown year round in glass houses plus in influx of foreign grown varieties shipped over from the continent by the container load we can even have this dessert at Christmas. Sometimes the continental strawberries do not have the full flavour we expect from our strawberries in which case cut them into quarters and sprinkle with a little cognac or whisky to add flavour before mixing them into your Eton mess. Double cream is one of the three traditional ingredients of this recipe. Beat the cream so that it is thick before mixing with the meringue and strawberries. Keep the cream in your fridge before use so that the dessert which should be served as soon as it is made comes to the table suitably chilled. Clotted cream to top off the dessert gives extra interest and flavour. Any type of meringue can be used whether it is crispy or has that delicious chewy centre. Simply smash up the meringue and mix it with the other ingredients. Pink meringue makes a pretty alternative to the recipe although having an all white mix (apart from the strawberries) gives a certain mystery to the dish and the eater is unaware of whether the next spoonful will be crunchy or creamy. Instead of mixing all the ingredients together and spooning into dessert or sundae dishes try layering the strawberries, meringue and cream to give a layered effect that looks very attractive through glass serving dishes. Try drizzling fruit sauce, syrup or coolie into the mix as it is served to give a different effect. Eton mess made with banana instead of strawberries is very tasty. Add crushed nuts as well for a different texture. Odd pots of mousse and yoghurt can be added to this dessert for more flavour and to use up those odd pots near their sell by date in your fridge. Remember to decorate the top of each dessert before serving. A whole strawberry, crushed nuts or even grated chocolate will present the dish to perfection.